These Picture Frames Are Part Of Our Extensive Swing Frame Collection! 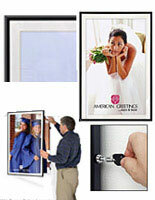 These Picture Frames Have A Clear Acrylic Lens To Protect Poster Inserts! The outer dimensions of this picture frame are 26.5"w x 38.5"h and a 1.75" area is needed on the left for proper hinge movement. 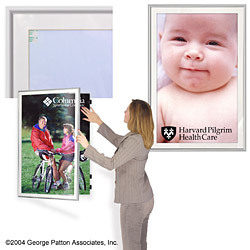 The slim design permits the front of this frame to protrude only 1.5" from the wall. 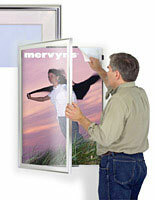 The observable area is 23.375"w x 35.375"h and mounting instructions and hardware are provided. Click here to view how to mount this frame. 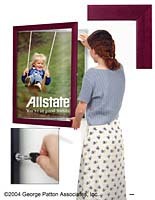 Changing posters was never easier than with this swinging picture frame. The whole front of this picture frame swings open to give you entrance to your 24"w x 36"h poster, print or artwork. The 1/2" wide aluminum framing has a radius top and is finished in satin silver. 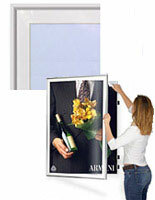 This aluminum frame accommodates the clear acrylic lens and the 1" wide white matboard. The concealed metal hinges fasten to an inner wooden frame, which mounts to the wall. The inner frame has black edges and is primarily concealed by the outer aluminum frame. An easy to use gravity latch system ensures the frame remains closed. A duraplast backboard is utilized for mounting of the posters or artwork, up to 3/16" thick, with provided removable/reusable tabs.